The GE LMS-100™ is the first inter-cooled gas turbine system developed especially for power generation. 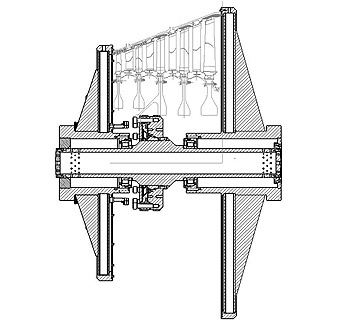 The Power Turbine is 83" (2108mm) in diameter and weighs in excess of 5000 lbs. (2250 kg). Our balancing tooling consists of modules for the static and dynamic balancing along with their associated lifting and storage equipment. 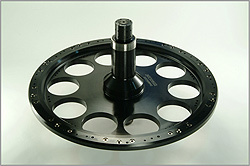 The static tool provides support for each of the 5 stages on a single plate. Removable taper pins are used to centre each stage. Taper pins produce more accurate location than an equivalent of a parallel design. 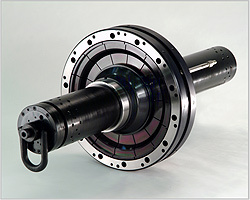 The dynamic tool supports the assembled rotor on a single through shaft, which is supported by high precision bearings in the forward and aft fixtures. A hydraulically actuated diaphragm tool accurately centres the engine on the shaft giving very high repeatability. Also included in the package is a storage and support stand. "I wanted to thank you again for the support you gave us with the balancing of our first LMS100 power turbine module. I sent a message out this morning to all of the Support Equipment managers and said that this tool package was a complete success. It is obvious that your attention to detail is superb as we did not have to rework a single piece of tooling that you supplied. I received several messages this morning from management thanking our team for getting this task done so quickly. Thanks and well done."